Maybe many of you are not familiar with his name. But Arthur Kahn is the author of some of Caracas´ architectural icons, including Pasaje Zingg and Residencias Altamira. He worked with Carlos Raúl Villanueva in the project of the Ciudad Universitaria and is also a musician and a singer. This year (2010) he achieved a century in total lucidity and reaffirms his optimism for a city which he declares extraordinary. This text reveals the story of a centenary genius which remains in oblivion. A bronze lamp with a star brightens the foyer of his apartment and throws some highlights over an abstract geometrical mural. After trespassing a worn-out white curtain, appear a double-height living room and a window, preceding a small terrace. On a black leather chair seats Arthur Kahn. He is a hundred years old. He is an architect, maybe one of the most important in Venezuela in the Twentieth century. Nevertheless, very few know his name. Arthur Kahn designed the Pasaje Zingg, the emblematic Residencias Altamira building in the Plaza Altamira, the Instituto Anatomo-Patológico building in the UCV´s Ciudad Universitaria complex, the famous Hotel Nacional. Also the first phase of the IVIC (Instituto Venezolano de Investigaciones Científicas), the BECO-Blohm building on the esquina of Puente Yánez, the Torre Aco in Las Mercedes, among many other Caracas´ icons. In spite of such a relevant architectural oeuvre, the register of his works are almost never included in Venezuela´s architecture history books. Today there are many who ask who is Arthur Kahn. A tale of life. Kahn holds the Venezuelan citizenship, having resided in the country for almost 70 years. He was born in Istambul, Turkey, on October 10th, 1910. He is the second of two sons of a couple of Turkish aristocrats. His lived his early childhood next to his elder brother, O. San, and his parents in the eastern part of Istambul, on the Bosphorus´ banks. His first language was Greek because, at that time, all the nannies in Turkey were immigrants coming from the Hellenic country. In 1915, little after the beginning of the First World War, Arthur Kahn, a five-year-old boy, moved with his family to Vienna. In the Austrian capital he received his first drawing and piano lessons. He discovered his ease for expressing himself graphically and his passion for music. At the age of fifteen he already mastered the trombone, the guitar, the piano and the bass. At seventeen, he traveled to Switzerland in order to conclude high school. He spoke Greek, German and English and from that phase on he got used to his new language: French. During his stay on that alpine school he studied with two Venezuelans: Alejandro Lara and Juan Liscano, whom he called "Americans from the South". In 1932 he worked as a trombonist in the orchestra of the famous American singer and dancer Josephine Baker while it was touring Austria. Years later it would be her, his friend Josephine, who would save his parents and his brother during the German invasion to France. This gesture would allow him to escape with his family to Venezuela. At 24 he moved to France to begin his architecture studies at the Ecole des Beaux-Arts of Paris, in the prestigious atelier of professor George Gromort. His student life coincided with the recession previous to the war, forcing him to work as a magician and as professional tap dancer in Parisian cafes, cabarets and vaudeville theaters in order to get extra money to cover his expenses. He received his Architecture degree in 1939, when the Great War was beginning, and finally, in 1942, he departed from Marseille with destination to Puerto Cabello (Venezuela). Kahn, the Architect. He arrived to Venezuela on July of 1942. His first job as a musician lasted few months, as he was hired as and architectural draftman in the Ministerio de Obras Públicas. "One day I met architect Carlos Raúl Villanueva. He had been commissioned by the Ministerio de Obras Públicas to elaborate the project of the Ciudad Universitaria. He proposed me to work with him, so I quit to the Ministry and joined Villanueva´s team", remembers one-hundred-year-old Kahn. With Villanueva he worked in the preliminary projects of the Ciudad Universitaria, in the design of the Hospital Universitario and in the building of the Instituto de Anatomo-Patología. In parallel, Kahn got the commission for the project of the Hotel Nacional (1947) next to the Avenida Bolívar, his first big work in Venezuela, now sadly demolished, but still remembered because of the Roof Bar he designed for the terrace. That merited an intensive journey. "I worked during the day with Villanueva in the project of the Ciudad Universitaria and by night, at home, in the project of the Hotel Nacional". More opportunities inmediately arose for Kahn, and after two years of work, he left Villanueva and started his own company: Arquidec C. A. "I had very good projects in my hands: besides the hotel, I began the edificio Altamira for Luis Roche in Altamira (1947) and the edificio BECOBlohm (1948) in the esquina of Puente Yánez for Jorge Blohm." According to Kahn himself, he obtained the job of the edificio Altamira almost at ramdom. Kahn knew that Luis Roche, one of the greatest developers of his time, planned to urbanize a big piece of land in the east of the city. He got an interview with him and offered him his services as an architect. Then, Luis Roche told him: "We are not architects, but we have very good Architecture books and that is why we never use the services of an architect." A phrase to which Kahn responded: "Dear Mister Roche, thank you for your hospitality and if one day you don´t feel well don´t hesitate to call me please, I am not a physician but I have very good Medicine books". The following day, Roche called Kahn in to discuss the terms of a contract in which he was hiring him for doing the project of the edificio Altamira. A few years after, in 1951, he began the Pasaje Zingg, the first Caracas commercial center and the first building in the city to have mechanical ladders (in wood) inside a passage that held 40 of the most elegant stores in the city and whose design conected two different level streets through an internal corridor. In 1954, professor Humberto Fernández Morán, the ­creator of the diamond scalpel, proposed Kahn to do the design of a sciences institute he was willing to create in Venezuela." The interview lasted seven hours. "At the end of our meeting we had a project and a friendship that would last until the day of his detah was born. I thus designed the IVNIC Experimental Pilot Unit (1954-55), the first complex of buildings of the actual IVIC". A Modern Quixote. 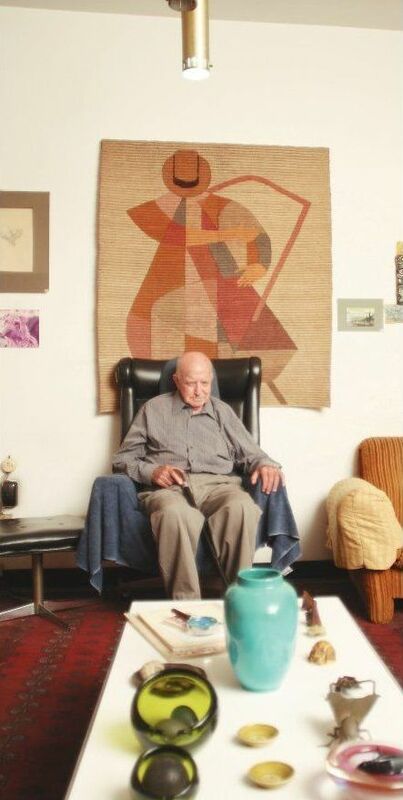 With the help of his cane, Arthur Kahn walks through his home´s living room towards the dining room. He loses himself on a chair and has a big piece of lemon pie and a cup of coffee and milk served to him by Juanita, the lady who has been working for him for 30 years. With the help of a magnifying glass, he checks on some old photographies. He struggles to hear clearly and refuses to use the earpiece. He speaks with difficulty, but answers questions in a precise way. There are days when he does not speak. Others when he is talkative. The lucidity of his gaze reveals that his oral expression is below the level of the speed of his thoughts. He stands up again and Sol, his nurse, helps him in a rhythmic march toward the terrace. In the background can be seen the image of a squatted skyscraper, as an enormous vertical favela, with the majority of its glasses broken, showing evidently that the project of modernity that once had this city was just an illusion. He begins his routine of daily exercises: with the cane he holds on to the railing and falls in a rather hard way on the chair that Sol placed behind him. He makes five rehearsals and ends. Then leads to his bedroom, a room in which he is surrounded by his watercolors. A colorful world of Mango, Acacia, Araguaney and Samán trees, forests and creeks. In his most intimate space there are no architectures, only landscape and nature. On his night table there is an old photograph of Arthur Kahn holding a microphone in his hand up on an scenario, or maybe it might be really Peter Anders, the alter ego which after each show always guaranteed applauses, in those years in which he practiced music and dance. The life of Arthur Kahn reflects the epic of a man that was born with the new century, at the dawn of modernity. He is maybe the last living modern in Venezuela. No one would imagine that this noted architect until a few years ago performed as a singer using the pseudonym of Peter Anders in some Caracas bars and restaurants. The first time he used this identity he was 16 years old, and he made it up doing a pun in German, a language in which the word "anders" means "other." In the Vienna of his youth we organized an orchestra called The Midnight Colibries. In his times as an architecture student in Paris at the Ecole des Beaux-Arts he created The Manhattan Trio and made a tour of France that helped him to pay for his studies while the war winds began to blow. Kahn founded in 1941, in Marseille, The Globe Trotters, a guitar, piano and trumpet trio with which he played in Montecarlo and whose performances gave him the necessary money to escape from the Nazi threat in France and pay the trip of his family to Venezuela. 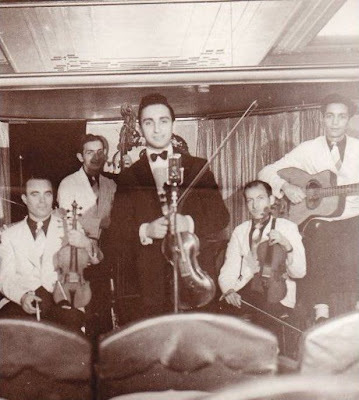 A few weeks after having arrived in the country, his first job in Venezuelan lands was a guitarist in the orchestra of renowned Luis Alfonso Larraín. "Tasca, restaurant or bar where there was a good piano, there was Arthur Kahn", says architect Nenad Marincic, one of his best friends. In the 1980s, on Friday afternoons, Kahn used to hang by the Restaurant El Parque and even singed in El Visconti, bot located in the Parque Central. In 1989 he opened solo a jazz festival in the Sala Ríos Reyna of the Teatro Teresa Carreño. On January 12th, 1992, he peformed a recital in the Centro Cultural Consolidado in homage to Bing Crosby. He even made a record with his repertory thanks to the help of Sound engineer Dusko Marincic.